Major League Baseball's All-Star Game is a major event in Philadelphia, where it has long signaled the unofficial start of football season. The Phillies' five-year run as playoff regulars changed that temporarily. If they'd been able to sustain excellence through Andy Reid's two-year nosedive, maybe they could have created a permanent shift. Instead, the Phillies are in their second season as a .500 ball club, and the pecking order has been restored. This is not especially good news for Chip Kelly as he prepares for his first NFL training camp. Unless Ruben Amaro Jr. can get Mike Trout for Kevin Frandsen at the trade deadline, Kelly and his team will have the full and undivided attention of every sports fan in the region. It will be very interesting to see how Kelly handles that. The early signs are mixed. During the team's last full-squad minicamp, when Kelly was obligated to meet with reporters every day, he seemed surprised and less than enthused about the number of ways he could be asked about his quarterback situation. "Every day we come off the practice field, they want to know, 'How did the quarterbacks do?' " Kelly told reporters last month. "No one was like, 'How did the gunner on the punt team do? Did you make your decision on that?' . . . For us, as coaches, we evaluate every position similar to evaluating the quarterback position." That may be true, but gunners aren't named MVP of the Super Bowl. It is absurd to compare the quarterback position to any other on the field. Kelly knows that, or he'd be waiting to open camp at a junior college in New Hampshire right now. At Oregon, he was able to conduct quarterback competitions under very different conditions. The Ducks were covered by local media and have an avid following, but let's not kid ourselves. This is the Eagles. In Philadelphia. Fans have been waiting for a Super Bowl victory as long as Super Bowls have been played. They ran out of patience about the time Hank Stram won one. There are different ways to deal with that. At his first training camp, in West Chester, Buddy Ryan grabbed a microphone and told several thousand fans his team would sweep the NFC East and win a division title that year. That didn't really work out. At Reid's first camp, he installed Doug Pederson at the top of his quarterback depth chart. The No. 2 overall pick in that spring's NFL draft, Donovan McNabb, took reps with the second team. This had something of the opposite effect of Ryan's boast, especially after the fans got a look at Pederson. But Reid knew it didn't matter whether the fans loved you in July. It was February that mattered. He had a plan to get there and he stuck with it, ignoring the drumbeat from many fans and media to throw McNabb into the fire. Kelly doesn't have his plan written in ink the way Reid did. But then, Kelly didn't invest the second pick of the draft in a franchise quarterback. He has three interesting but flawed candidates for the job and he hasn't seen any of them run his offense at full speed. There is no way for him to choose his starter. Most head coaches would have listed Michael Vick, Nick Foles, and Matt Barkley - in that order - on the public depth chart and worked from there. It would have been easier all around. After answering 1.4 million questions about who took the first reps, who took the most reps, who threw more accurately, who has the best Twitter feed - maybe now Kelly wishes he'd done things differently. It will be like that all summer. 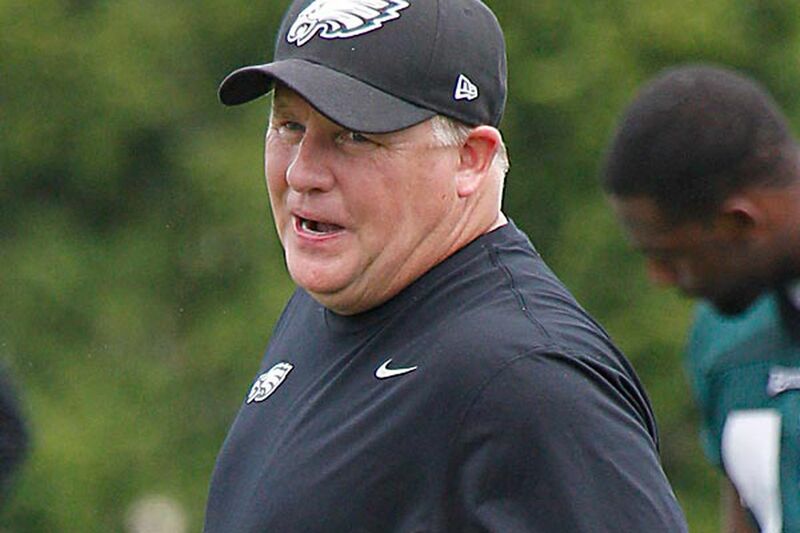 The suspicion here is that Kelly isn't just using this training camp to choose from among Vick, Foles, and Barkley. He will use the entire season. And when it's over, if one of them hasn't claimed the job, the process will continue through free agency and the draft next year. He may be looking for a new gunner, too, but no one will be talking about that then, either. Contact Phil Sheridan at psheridan@phillynews.com. Follow on Twitter @Sheridanscribe.